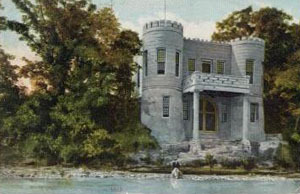 This is a photo of Kegonsa Castle at Lake Kegonsa, near Stoughton, Wisconsin. Does anyone have more information? Does this building still exist? Yes, this castle still exists. The columns you see toward the lake (and the roof they support) are gone now - I suppose the winter weather and the lake conditions took them away years ago. It is on the south shore of the lake on Barber Drive. I don't know the exact address. The land on either side of the castle is now well built up with houses, but the castle still looks pretty much like it does in the picture you show. There are some local rumors that Al Capone had either had it built or had owned it at one time. I don't know if this is true, but I do know that Al Capone had owned some land on Lake Kegonsa and may have owned a speakeasy there. No one ever seems to be around this house. I had an opportunity once, about 12 years ago, to peak in the windows. The place is rather dusty and run down. There is still furniture inside and some newspapers, that kind of thing. I don't know who owns it, but when I was there, it had been largely unmolested. My great-grandfather and his partner built the castle in the early 1900’s. Their names were Gunder Anderson (my great grandfather born in Norway) and Peter Sorensen (from Denmark). Both were carpenters and decided to build this castle on Lake Kegonsa together. They made forms for the bricks themselves. Peter Sorensen bought out my great-grandfather’s interest in the property when he married his wife Hanna, just as they were finishing construction. They lived there for over 40 years before selling and moving into town, about 1941. I don’t know who bought the property in 1941, but after several years in it, they put on an addition. The site was selected because of the solid rock shore, and the close proximity to what was the main highway. When the interstate system was put in during the 50’s, they changed the roads around the lake. The balcony on the photograph was destroyed by a fire around 1950, which also damaged the back part which was added. My aunt and uncle grew up in Stoughton and have no recollection of Al Capone ever being in the area, but I can say with a fair degree of certainty that he never had anything to do with this castle. My aunt (Gunder’s daughter) says that the person sitting on the rock in the photo is probably Peter’s brother in law, Frank Sargent, who was a frequent visitor. The castle is still considered a major landmark in Stoughton, and there are still many fond memories shared by many members of my family who spent time there. This castle is much renovated now and it is almost funny to see such an old picture of it. Many years ago there was an addition put on, an entire second floor. The turrets that are shown over looking the lake are accessible from either bedroom. It is proper to refer to the castle as the side of the lake being the front and the back being the inland side. The master bedroom over looks the backyard in that case, and the way it is modeled now it does look like a castle from all sides. There is an inaccessible balcony off the master bedroom. The columns and porch that overlook the lake have been fixed and it is now an indoor porch with windows on all sides. There was a fire years ago that led to the castle not being used for many years, that is probably why people say it may have looked run down, the property to the left was used instead for those year, it is referred to as the "dollhouse" and to the right of the castle is the boathouse. With a garage entrance for the boat and an apartment above. The castle also has it's own fresh water springs under ground, they are not in use anymore but were for many years. Inside the castle is all hard wood floors and there is a motif of 40's and 50's lifestyle with a number of antique chandeliers and countless antique furniture. It is a wonderful place to spend time away from the hassles of life in the city (Chicago). It's current owner realizes everything that she has and this landmark will stay in the family forever.